When working with concrete, the last thing you want to worry about is a tool that barely makes its way through the material, leaving you with more work than necessary. The will use its unique hammering action to work through concrete, saving you time and muscle fatigue. We searched through several hammer drills to find the best hammer drill for concrete. This guide features five of our top picks that have plenty of power to work with concrete and can fit within a range of budgets. The DeWalt DCD985B Hammer Drill is surprisingly compact, but has three transmission speeds to deliver incredible RPMs combined with powerful torque to make it versatile for several construction-related uses. 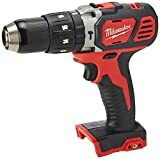 Milwaukee Cordless Compact Hammer Drill has an incredibly sturdy construction with metal-encased gears that can stand up to the wear and tear that concrete puts on power tools. TACKLIFE Hammer Drill is easy to adjust to your project with its variable speed trigger and dual drill and hammer modes to give you extra power only when necessary. DeWalt DW511 Hammer Drill is a lightweight tool that customers love for its comfort. From the gripped trigger to the rotating handle, DeWalt designed this hammer drill for a safe and natural grip. Ryobi P251 One+ Hammer Drill has three work modes – drive, drill, and hammer – so it may be one of the most versatile options to help you with a variety of projects. The following five options are our picks for the best hammer drill for concrete based on their proven performance, customer satisfaction, and beneficial features that can help you get the job done. The DeWalt DCD985B is a couple of steps up from the DW511, but it’s also at a higher price point. If you’re looking to do some serious concrete or masonry work, though, this one will probably better meet your needs. 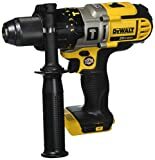 The cordless hammer drill has a 20-volt battery paired with a high-efficiency motor that can let it run longer without using as much battery power. This drill has 22 chuck settings to adjust the torque, plus a variable speed trigger to fine-tune your speeds. Get a firm grip on the tool by taking advantage of its side handle, which rotates 360-degrees to match your positioning. Customers have completed several types of projects using this hammer drill, from light household work to more intense concrete and masonry projects, and several of them praise its performance, especially for its price. The Milwaukee Cordless Compact Hammer Drill can be an excellent option for people who want a portable option not limited by a cord. This tool is compatible with any Lithium-Ion battery from Milwaukee’s M18 line. This hammer drill is designed to last with its heavy-duty casing and metal that surrounds the gears. Still, the overall weight is light, making it comfortable to transport and maneuver. You can choose from 18 positions on the clutch that can help the drill power through just about any material, and you can further adjust speed with the variable speed trigger. Push the mode button to choose between hammer, drill, and drive modes for ultimate control over its usage. For creating precise holes in concrete, the LED light panel underneath the chuck can illuminate a work surface even when natural or artificial light is scarce. Some customers are disappointed in how fast the tool heats up, as its built-in safety feature automatically turns it off if it overheats. However, others say that the Milwaukee hammer drill is the right option for basic concrete projects that don’t require the drill for long periods at a time. The TACKLIFE hammer drill is one that’s probably best for light concrete work because it may not offer the power that some of the other options do to power through more massive projects. Still, it has some beneficial features and an excellent price point that could make it the best option for some. You’ll notice that this hammer drill is relatively long, but it’s also narrow, so it shouldn’t have a problem fitting into tight spaces. It’s also lightweight at just over 4 lbs., which can save you from muscle fatigue as you work. 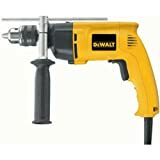 One of the best features of this drill is its adjustable handle that you can move depending on the position you need to be in, making it comfortable and safe to grasp. The quick-release depth gauge is also a helpful feature that prevents you from drilling too far into a material. Several customers praise this tool for its versatility and power for its price tag. Those who experience hand pain or weak grip also say that this tool is the right choice for them because of its easy-to-hold design and weight. DeWalt is one of the biggest names in the business, and its DW511 model is a basic, but one of the brand’s most popular, hammer drills. This drill is a lightweight, narrow model that’s not only designed to be powerful enough for concrete, but also to be comfortable for users. This drill has a single-speed transmission, but you can adjust your drilling speed by using the trigger. The trigger even has space enough for two fingers instead of just one to increase your grip and comfort during use. The side handle is a feature that makes this hammer drill stand out. Its convenient spacing from the trigger and handle combined with its ability to rotate 360-degrees makes it conform to just about any position you need to hold the tool in. Customers like that this hammer drill is simple, compact, and designed for comfort, although most agree that it’s not the best option for heavy concrete work. The Ryobi hammer drill is one that offers an excellent balance of size, weight, and power. Although relatively compact and lightweight, the tool packs in a lot of functionality and controls to help it power through tough concrete. First, you can benefit from the 24-position clutch to vary the torque on hammering mode, up to 750 in.-lbs., which is perfect for concrete. You can also use the variable speed trigger to alter the speed, giving you just the right combination of torque and speed for just about any project. You’ll also be able to choose from three modes – hammer, drill, and drive – to make the tool do what you need it to, depending on the materials you’re working with. Switch between them with an easy-to-use button. The handle on this hammer drill can screw into either side of the body, so you can use it with whatever hand you’re more comfortable with. People who have purchased this Ryobi hammer drill praise it for its power with tough projects, especially for its low price point. Some customers have also noted that it’s an excellent addition to their collection of other Ryobi products because the battery is interchangeable with most other Ryobi tools. Most power tools give and take when it comes to power and weight, and hammer drills are no exception. While one drill might be lightweight, it may not deliver the hammering impact that a heavier drill would. You’ll need to decide what’s more important to you based on what kind of projects you’ll mostly use the hammer drill for. Do you need significant impact for heavy-duty projects, or will a more compact and lightweight tool work for your smaller concrete projects? Lightweight power tools can decrease muscle fatigue, especially with hammer drills that vibrate your hand, finger, and arm muscles while you work. However, one that’s too light may not be durable or powerful enough to handle tough jobs. Concrete is one of the toughest materials out there, so you’ll need a hammer drill that can hold its own. While you can usually get away with a regular drill made from inexpensive plastic for household projects, a hammer drill needs to have a strong, durable body that can lend to its overall power and stand up to pieces of concrete. It’s especially important to consider what materials make up and protect the motor and its gears, since these parts are what allow the drill to work through concrete. Metal-surrounded parts can significantly increase the life of your hammer drill. A variable speed function is crucial to look for in most power tools because it helps you gain control over the device. It’s also a necessity for your hammer drill because you may need to adjust your speed as you work through concrete. The best way to switch speeds is with a variable speed trigger, which lets you adjust your speed with your finger by pulling in or depressing the trigger. It’s simple and convenient because you can change your speed without having to stop the drill. You’ll notice that some hammer drills have what’s referred to as a “dual mode,” which refers to the tool’s ability to act as more than just a hammer drill. A dual mode drill can switch between regular drilling mode for wood and softer materials and the hammer drill mode for concrete and masonry work and may also refer to a dual impact-hammer mode. Some hammer drills won’t be able to switch to another mode, which will limit its versatility. However, if you already have a regular drill or don’t need the extra options, you may be able to spend less money on your hammer drill by opting out of buying one with a dual mode feature. The DeWalt DCD985B Hammer Drill is one we’d recommend to give you the best versatility and performance at a decent price point. From lightweight to heavy-duty jobs, the 22 clutch settings, metal transmission, and high-efficiency motor make this drill able to complete just about any project. As for concrete jobs, the powerful hammering action combined with securely-grasped bits make this drill powerful, reliable, and safe. We outlined some of our favorite hammer drill options for working with concrete, giving you some solid choices that can meet the needs of most projects and budgets. We hope our guide leads you to find the best hammer drill for concrete with the features you want most.